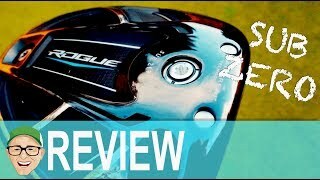 The Callaway Golf Rogue Sub Zero Driver is designed to promote a combination of fast ball speed and extremely low spin, while also being extremely forgiving and easy to launch. That’s extraordinary because low-spin and forgiveness are qualities that historically haven’t co-existed in a better-player’s driver, making Rogue Sub Zero a superior feat of engineering and a unique offering: A driver designed to deliver launch conditions that appeal to Tour pros, yet is so easy to hit that many amateurs will want to put it in play. 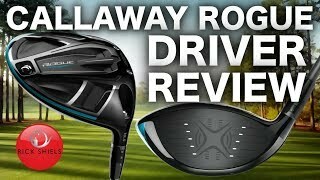 Rogue Sub Zero’s high-level performance starts with Callaway’s patented Jailbreak Technology, which drastically changes how the head behaves at impact. New, hourglass-shaped titanium Jailbreak bars save 3 grams without affecting their effectiveness at stiffening the crown and sole, allowing the ultra-thin face to take on more impact-load to promote more ball speed. more speed and distance on mis-hits. Together, the speed-enhancing benefits of Jailbreak and X-Face VFT technologies create what we call the “Jailbreak Effect” to promote more distance on every swing. The crown consists of Callaway’s proprietary triaxial carbon composite, which is both extremely light and extremely strong, saving weight normally positioned in the crown. This is critical, because the abundant saved weight is redistributed in the head’s perimeter to increase MOI and forgiveness, and to help position the CG in the desired place to minimize spin off the driver. 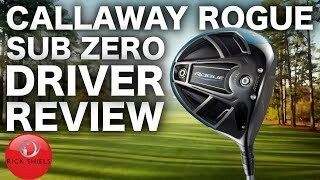 That, in conjunction with Rogue Sub Zero’s head shape and construction, allows Callaway engineers to position the CG low and deep with a more neutral bias. This position, along the head’s neutral axis (the line that runs perpendicular to the loft and intersects with the geometric center of the head), promotes higher launch and low spin — the launch conditions that promote maximum distance. Two interchangeable weights (2g and 14g) in the front and back of the sole allow you to adjust spin-rate ±300 rpm. Positioning the heavier weight forward helps lower the spin-rate; positioning it in back increases spin, launch angle and MOI to increase forgiveness and promote higher launch. Callaway engineers collaborated with Boeing to develop the Speed Step technology used in certain Callaway metalwoods introduced during the past three years. With Rogue Sub Zero, we again worked with Boeing to improve air-flow by incorporating surface roughness at the front-edge of the crown. This allows the Speed Step to regulate airflow more efficiently to promote faster head speed. Rogue Sub Zero is a remarkable feat of engineering, the product of superior vision, research, testing and execution. Players of all skill levels who can benefit from the distance-enhancing advantages of a low-spin driver should find it easy to launch than the average Tour-level driver.